Fine art, Illustration, graphic design and the art philanthropy of Sam Morrison: Stop the Buses! At the meeting, I merely mentioned paying the school bus drivers 15 cents more per hour was an extravagance. After all, the janitors’ budget was razor thin. Janitors get real cranky when there isn’t enough sawdust to absorb kids’ vomit. The janitors let me know, in no uncertain terms there was a sawdust crises that they hadn’t seen since the flu outbreak of 1977. I felt I had to take action. Since I fancy myself a social equality advocate I felt good voicing my disapproval of school bus driver wage increases. Sure I met with quite a few boos and hisses from the school bus drivers. Most were ugly women so I didn’t much care. I had to remember to stay focused since I was giving a voice to the voiceless janitors. I vaguely remember saying “bring it on ladies!” Their boos and hisses were validations I was doing the right thing. The more the better. It had been a few weeks since the board voted down the bus driver wage increase in favor of more absorbent sawdust. Although the board denied it was for sawdust. Stating it was increasing the overall budget for the school from which the janitors would benefit. Whatever. Social equality triumphs again! This brings me to the spring of 2000. As we all know spring usually brings road repairs. That spring was no different. What was different however, was the repairs were going to be right outside my front door. It was told to me by one of the road crews my street was going to be reduced to one lane throughout spring and summer. They were going to repair one side of the street in spring and the other during the summer. Also mentioned was the fact the main thoroughfare at the end of the street near the school would be blocked off. This basically meant there was going to be only one way in and one way out on my street. All the traffic both coming and going would run right past my house. Before I go too far I Should clarify the location of my house. I live two houses down from the school and school bus parking lot and, my driveway lies parallel to a pair of train tracks that sneak their way through town. Anyway, I thought the extra traffic would be irritating but, I took solace in the fact it was only going to be temporary. Life would go on as usual. I was startled awake by construction traffic that Monday morning. Construction began quicker than I anticipated. Despite that, I went about my normal morning schedule. I showered, ate and hopped in the car at 7:15am to get to work by 7:30am. 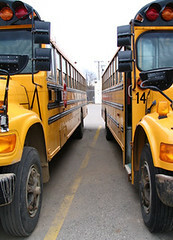 As I prepared to back onto the street I noticed a long line of 24 yellow school buses beginning to convoy past my house. I knew I had precious seconds to slam my coffee in the cup holder and punch the accelerator to beat the first bus. Unfortunately, I missed the cup holder by inches as I strained my neck rearwards to accelerate the car into reverse. My precious seconds had evaporated quicker than the steam from my coffee soaked floor mats. Never in my life had I seen that many yellow school buses coming in my direction. On a normal school day I only had to wait for the three buses that would pass my house. Most of the time I left before they crossed my driveway anyway. So there I sat. 24 yellow school buses with flashing lights began their legally obligated duty to stop at the railroad tracks, open their doors and check the tracks for trains. Ok I missed the first bus. Surely one of the other bus drivers will allow me to back onto the street and off to work I’d go. I t appeared that’s what was going to happen. The driver of the second bus motioned me to merge on to the street. Oh, how kind I thought. But then she, just as quickly, pulled forward almost bumper to bumper with the first bus. If that weren’t strange enough, as if choreographed by some tractor square dance caller all the other busses tightened their formations too. All 22 remaining school busses locked in bumper to bumper solidarity began inching forward. Let me tell you the Blue Angels Flight Team had nothing on these ladies. It’s been many years since that incident. I have to say my views that society has to be careful who they give power too has only deepened. I just want to scream “Wake up society! Don’t you get it! ?” A big yellow school bus in the hands of an ugly woman shouldn’t be tolerated.